In this kind of setting, the stone is set completely in the metal so that it looks like its surface is on the same level as the rest of the metal. It is the most stable kind of setting for the safety of the stone.Unfortunately, the stone in this setting has to endure a lot of tension while being set, and if not crafted with experience or care, it can easily get chipped or damaged. Thus the setting cost is a little on the higher side. Also, in this kind of setting, the stone looks a little smaller and also the metal covers it enough to retard the light reflected back from it. The other disadvantage of this kind of setting especially in case of deep cut stones is that the amount of metal used is much more than other conventional settings such as prong or bezel settings. The thickness of the metal has to be more than the depth of the stone, so most big stones are NOT set in this style unless manipulated by design technically. 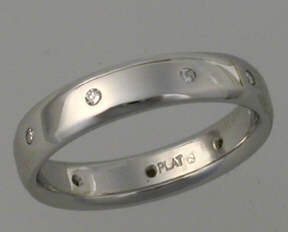 This kind of setting is usually recommended for tougher stones such as Diamonds, Rubies, Sapphires etc. Almost all stones set in this setting look gorgeous especially when complimented with matte finish. This of course depends on the design itself. Click here to learn how to set a stone in Flush Setting?